Reading Just Got Even More Fun With Talking Books! San Mateo County Libraries has a new addition to our collection: VOX Books! 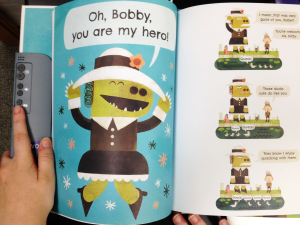 These books are a hybrid between an audiobook and picture book. VOX Books have a built-in audio player on the inside of the cover. There’s no need for a CD or separate device to play the audio; kids can simply push a button to listen and read. https://sanlib.org/2017/04/28/new-vox-books/, opens a new windowopens a new window by Sanibel Public Library Child holding a VOX book. The VOX reader narrates at steady pace so kids can read along with the print book. There are also audio cues for when it is time to turn the page. Children can listen to the book with headphones or without, which makes them ideal for group listening or reading along with a parent. Got a repeat reader? No problem! VOX Books have a long-lasting battery that provides 100+ listens before it needs a recharge. There’s also no data or WiFi connectivity required to use VOX Books. San Mateo County Libraries’ collection of VOX Books are picture books for children ages 4 to 7 (Pre-K to 2nd grade). VOX Books are also helpful for English Language Learners (ELL) of any age. Hearing fluent English read aloud can help ELLs with pronunciation and vocabulary building. You will find VOX Books at all of our branch libraries with the children’s picture books. VOX Booksopens a new window are available to check out for three weeks to all cardholders. Check them out today! Have you read a VOX Book? Share your thoughts below!